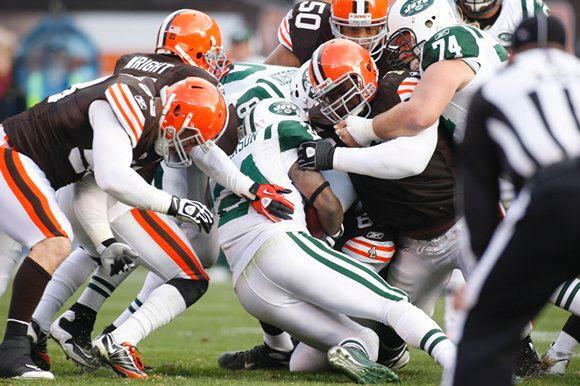 The Cleveland Browns hit the road on today to take on the New York Jets for the first of two season-ending road games. The Browns enter the game having lost five in a row overall and five consecutive on the road. In the Jets, they will be facing a team that is a respectable 5-2 at home. In addition to the usual issues the Browns have to deal with on a weekly basis on offense, they will be without tight end Jordan Cameron, and possibly wide receiver Davone Bess and cornerback Joe Haden. It should be another fun Sunday afternoon in the swamps of Jersey. The match-up with the Jets was going to be a tough one for the Browns, even before this week’s latest news out of Berea. The Browns have not won a road game since facing Christian Ponder and the Minnesota Vikings in Week 3 and, despite having a poor overall record, the Jets are respectable at home, with wins over New England and New Orleans. Presumably quarterback Jason Campbell is over the funk from the Patriots game that he said carried over into last week’s loss to Chicago, but just what he and offense can accomplish this week remains a big question. The Browns couldn’t run the ball against the Bears and their NFL-worse rush defense, and things don’t get any easier this week as the Jets are allowing a league-low 3.2 yards per carry, are third in rushing yards allowed by game with 86.1, and are tied for second by allowing just four runs of more than 20 yards this season. Of course, the Browns are near the bottom of the NFL in every significant rushing statistic, so, like most weeks, we can dismiss the running game as an option. With little to no hope of running the ball the Browns will have to once again turn to the passing game, which this week, even more than ever, will consist of throwing the ball to Josh Gordon and hoping for the best. Cameron, who leads the Browns in receptions with 75 to go along with seven touchdowns, is out after suffering a concussion against the Bears. Bess may also miss the game as he is dealing with what the team describes as a family issue. The Browns still have Gordon, though, and he will be going up against a Jets pass defense that isn’t very good against the pass – especially when it comes to cornerbacks Antonio Cromartie and Dee Milliner. Pro Football Focus gives Cromartie its third-lowest coverage grade and Milliner is still learning the game as a rookie. There could be opportunities for Gordon to make a play, but having him as the sole option on offense may be too much for even someone as talented as Gordon to handle. If the Browns are going to win the game, it will most likely fall on the defense to keep Jets rookie quarterback Geno Smith in check. The Jets are one of the worst passing teams in the league, averaging just 178 passing yards a game and throwing 22 interceptions – the second most in the NFL. Smith has alternated between being mediocre – in his last two games he has completed 58.5 percent of his passes to go along with two touchdowns and two interceptions – to being awful – in the five games before that, Smith threw eight interceptions and completed just 47 percent of his passes. Browns defensive coordinator Ray Horton lamented this week the fourth-quarter leads the Browns have given up the past few weeks – they have given up eight scores in their last nine fourth-quarter possessions – but at least two of those games were against Tom Brady and Jay Cutler, so the other team deserves at least some of the credit. This week, if the Browns can hold their own against a solid Jets ground game, they shouldn’t have to worry about Smith come the fourth quarter. When two teams with little to play for face each other at this time of the season, it can be hard to know how things are going to play out. The Jets seem to have more to play for in their home finale as they are looking to finish the year 6-2 and coach Rex Ryan may be looking to save his job. The Browns, on the other hand, are trying to make it to the end of another lost season, one where the front office is ready to turn the page to 2014. But then the Browns turned in performances the past two weeks that were almost good enough to beat the Patriots and the Bears, two teams that are thick in the playoff race. Even with everyone available, the offense still struggles to score points and this week the Browns will be hampered more so than usual with Cameron and (possibly) Bess in the lineup. If this were a home game, we may feel better about the Browns chances. But that 1-5 record on the road is just too big of an indicator to ignore. Take the Jets and the points in what should be a close, and potentially ugly, display of football.